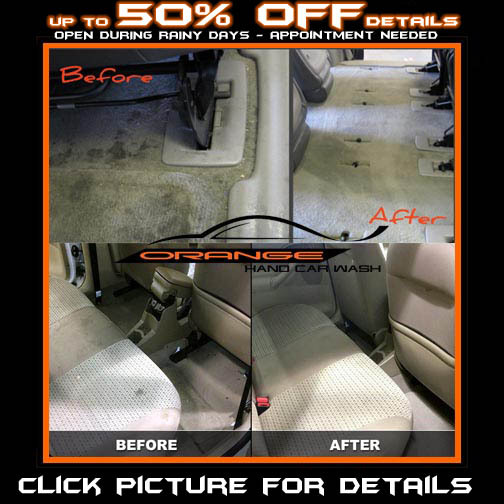 The 50/50 Detail Promotion offers you the opportunity to save some big $$$ on our detail services. If you see a day on a local weather report that calls for 50% or more in rain/showers, we will offer you 50% off our regular price/quoted detail services for that day. Bonus offer: Contact us for a day that shows any percentage of showers below 50% and we will discount your detail service that percentage for that day's appointment. Must call and schedule an appointment to receive discount. Limited spots available each rainy day. Interior/Exterior/Complete/Clay Bar/Shampoo Services all included. 5 day max outlook from current day to claim offer. Offer only valid on detail services.